Curtis loves to go to Aldis. He also loves to find random stuff to buy while he's there. Some of the things he has brought home include pillows, a food scale, and a space heater. 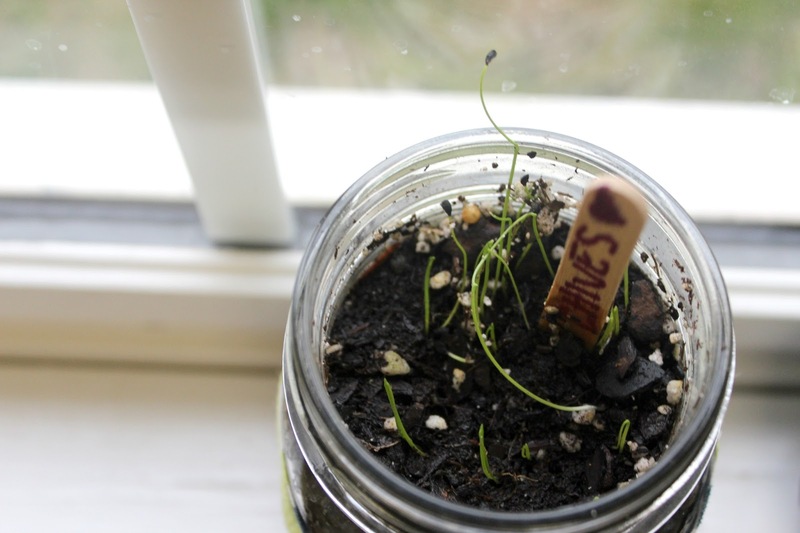 Most recently, he came home with several little seed packets for various herbs. He didn't mention anything about them, but I noticed them sitting on the kitchen window sill. We have talked about starting a little window herb garden for a while, and as Valentine's Day approached, I decided to go ahead and start our garden for his gift. Eventually, I would like to have a window box so we can grow larger vegetables, but I tried to imagine installing one by myself to surprise Curtis and in my head, it didn't turn out so well. I knew only my handy husband could attach a window box without messing something up! I decided a small, indoor, planter would be the perfect thing! Mason jars have so many uses. I bought some at Walmart, and so far they are working great! I planted chives and thyme for now. We will probably add to our herb collection with some basil soon. and we are starting to see little bright green buds peaking out from the soil. It is so exciting to see! It's also a fun way to get Ande and Owen involved in something. They love watching how the seeds grow and reminding me to water them each morning. 1. Obtain mason jar (s). 2. Fill the bottom with sand/pebbles/stones/rocks about 1/4 of the way up. 3. 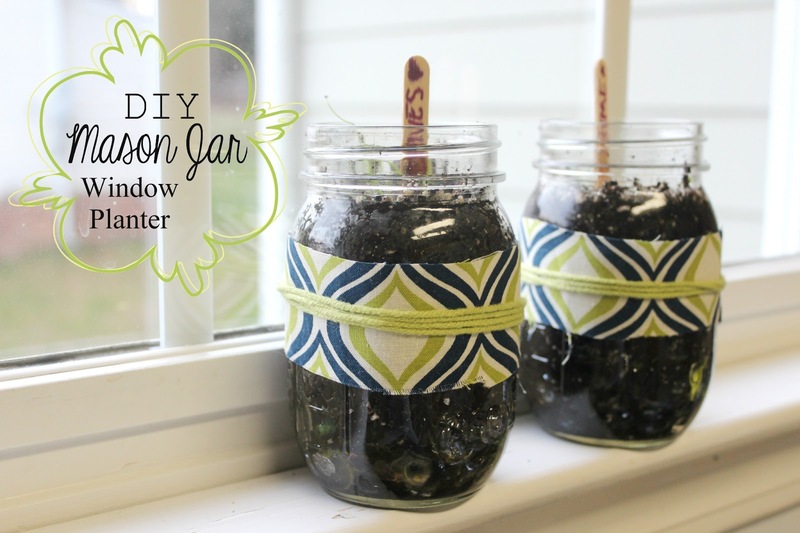 Fill in the rest of the jar with potting soil. 4. Plant seeds just under the top of the soil. 5. 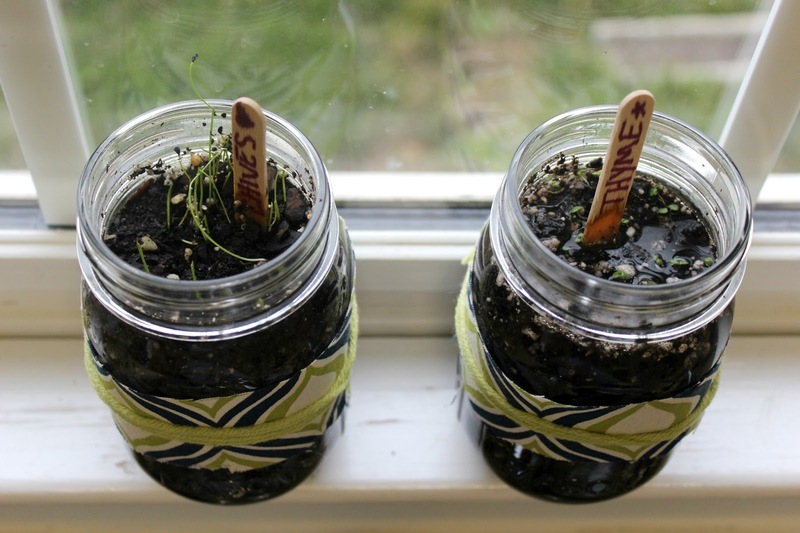 Add popsicle sticks or clothespins so you remember where you planted each herb. 6. Add some fabric and yarn scraps for cute-ness. 7. Water and place on your window sill to catch the light.